This study was commissioned and funded by the Canada Council for the Arts with an additional financial contribution from the Ontario Arts Council. Currently the Canadian Dance Assembly, the national service organization for dance, manages and maintains the map. 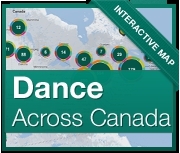 In 2011 the Canada Council for the Arts, in partnership with the Ontario Arts Council, launched the Canada Dance Mapping Study to identify, quantify and describe the ecology, economy and environment of dance in Canada. It was an initiative to investigate dance in its evolving state and in its multifaceted influences on the lives of Canadians. For more information continue reading HERE. You can explore the map by clicking icons on it or using the search fields below the map. If you are not getting results, try clearing the search fields and do a more general search (such as typing in only part of a name or selecting multiple dance forms). Remove any text in the Name Search field if you choose to use the fields instead. Use ctrl + scroll to zoom in and out. Click Reset to return to the initial view of the map. How can I access my map entry? You can view your map entry by logging in here. Once you've logged in, you will see a list of your map entries. You can also click 'Manage' from the main menu once logged in. On the manage page, you'll see all of the entries you've created with your logged in account. Click the edit link next to an entry, and you will be able to update the information for your entry. How do I add my organization to the map? From the main homepage, click the "Get on the map" button in the top left corner of the map. This will bring up an entry form, which you can fill out to get your organization on the map. You will see this same button below the list of your entries on the Manage page (only available to logged in users). Please click here to login. From there, fill in your email and password, and click the submit button. If you've forgotten your password, you can click the reset password link on that page. If you don't have a login yet, you can create an account by adding an entry to the map (please see above question for instructions). If you have an entry on the map but no email affiliated with that account please Contact Us and we will set up your login profile. Can you explain the categories you’ve chosen for the map? In order to have a manageable number of categories we grouped related functions together. Each category has an icon associated with it. Organizations can be tagged with multiple categories. Here is what you can find in each. Association/network: These are member-based dance organizations. They might be ones that support a wide range of dance forms and modes of practice, such as provincial service organizations, or be very specific to a region or style. In some cases the organizations might refer to themselves as clubs. Dance instruction/training: This category includes any type of school that teaches dance ie: commercial, pre-professional and recreational schools, universities and colleges. It can equally apply to organizations that are not focused on training but regularly offer dance workshops. Dance troupe/company: This category includes professional dance companies/troupes/crews/collectives as well as non-professional ones. The main focus of these organizations includes some form of public presentation. Dance instruction/training: This category includes any type of school that teaches dance: commercial, pre-professional and recreational schools, universities and colleges. It can equally apply to organizations that are not focused on training but regularly offer dance workshops. Event/festival/competition: This category captures special events, or events that happen annually or on a recurring but infrequent basis. It does not include shows or tours by a single dance company/troupe. It also does not attempt to capture the specific dates of the events and instead links to the event website for that information. For events that are hosted in changing locations we’ve located the organization on the map, as much as possible, in the city where its administration is based. Funder/policy maker/sponsor: This category includes public arts funders at various levels of government (municipal, regional, provincial, federal). It can also include charitable foundations that support dance and private sponsors who might fund dance. Policy makers are government departments or agencies. Note that we have yet to research this area so the map contains only a sampling of the many entities in this category. Management/professional services: This category includes a collection of companies that offer services to the dance field, for example, companies which offer management or administrative services, financial or accounting services, marketing services, media and multi-media services and the like. These companies often serve other artistic disciplines other than dance. Presenter/promoter: This category captures the organizations, large and small, that help bring dance to the public. Many presenters are also venues, for example, the Canada’s National Arts Centre (Ottawa) and events, such as the Adaka First Nations Cultural Festival (Whitehorse). Venue: This category captures locations that host dance performances, such as community facilities and professional theatres. It also includes dance studios, companies, etc. that make their facilities available to other dance groups. Note that we have yet to research this area so the map contains only a sampling of the many entities in this category. Leisure dance club/group: This category includes recreational or leisure dance clubs and regular social events where dancing takes place in a participatory fashion. Often beginners are welcome and there is some instruction during the event. Regulars may be participating for social, cultural, recreational, health or various other reasons, and may have strong commitments to and many years of experience in the dance form.